A pictorial report of this event can be seen in our Photo Albums section on this page. 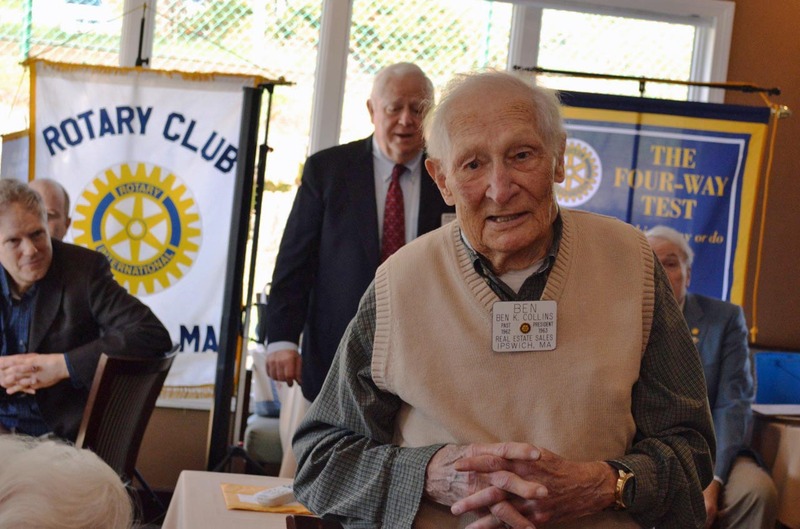 Ben Collins celebrated his 65th Rotary anniversary on April 14. It also was his 96th birthday. He is still going strong at 96 and regularly attends our weekly meetings. On hand for this day of celebration were District Governor David Manzi, District Governor Nominee Dave Gardner, and Assistant Governor Mark Golub. They presented certificates from the District marking the occasion. Governor Manzi also delivered a framed citation from Rotary International President K.R. Ravindran. Rotary Director Julia Phelps, who had arranged for the President’s certificate but was travelling and unable to attend, sent her congratulations. Club President Bob Gravino, assisted by DGN Gardner and AG Golub, presented Ben with a Paul Harris Plus-4 pin and medallion from the Club recognizing his 65 years of service. Long-time friend and Rotarian, Jim Tedford presented a club flag signed by the members. The Ipswich Club also marked his birthday with a beautiful and delicious cake and a rousing chorus led by other April birthday celebrants. Gloucester Rotarian Barry Pett, aide to Senator Bruce Tarr who was ill, filled in for his boss and presented recognitions from the Governor and from the state Senate. Rep Brad Hill offered congratulations from the House of Representatives. Rotarian and Town Manager Robin Crosbie spoke on behalf of herself and the Ipswich Selectmen. The day was made even more special by the participation of members of Ben's family and several of his oldest and dearest friends. It was a great day for Ben and a great day for Rotary. Congratulations Ben for 65 years of Rotary service, and for a lifetime of humanity.